Located in Lower Yoder Township, Cambria County, PA, on the mountaintop above St. Clair Road. From St. Clair Road out of Johnstown, travel through Morrellville and turn right onto Marburg Road. From there turn left onto Mountain Road (TR 375). This road winds up the hill and turns into a dirt road as it passes behind the St. Stephen's Cemetery. The dirt road ends at a parking area about two miles up the mountain. From here take the northwest trail for about 40 yards to where it forks. Take the trail to the left to the west. About a half mile up the mountain, the trail crosses over a dirt road. Continue straight up the hill for another quarter mile. 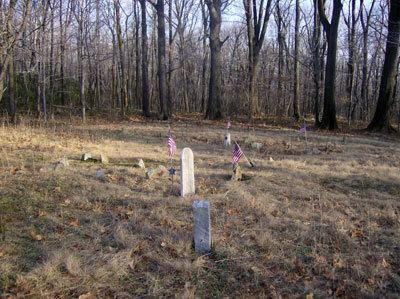 In the open area to the left, the cemetery is situated out about 80 yards.